Prerequisites: METEO 411, METEO 421. Enrollment Policy – Students who do not meet these prerequisites may be disenrolled according to Administrative Policy C-5 if they do not have the proper prerequisite override. If you have not completed the listed prerequisites, then consult with the instructor. Students who add the course after being disenrolled according to this policy are in violation of Item 15 on the Student Code of Conduct. Course Description: This course builds on the foundations laid in Synoptic and Dynamic Meteorology courses by exploring atmospheric processes in the tropics. We will examine distributions of mass, momentum, energy, and water vapor in various tropical weather phenomena and the overall tropical climate. We will spend a significant amount of time covering tropical cyclones, with focus on their development, maintenance, climatology, and forecasting. Demonstrate knowledge of the major sources of spatial, seasonal, and interannual tropical variability including tropical waves, ENSO, and MJO. Class textbook: Introduction to Tropical Meteorology by Laing and Evans. This textbook is available free online at http://www.meted.ucar.edu/tropical/textbook_2nd_edition/. To use this resource, you will have to register with the UCAR/COMET program. Use of all UCAR/COMET modules is free; registration is for tracking purposes only. Optional resource: An Introduction to Dynamic Meteorology by Holton and Hakim. Additional reading material will be posted on the Canvas class website throughout the semester. Homework and quizzes: There will be several homework assignments and quizzes during the semester, each with an equal grade weighting. The lowest homework/quiz grade will be dropped from your final grade. Late homework (up to 24 hours late) will be accepted with a 25% penalty. Exams: The midterm exam is scheduled for 6:00-7:15PM Thursday October 12th. The final exam will be scheduled by the University. Weather discussion: Each student will give at least one tropical weather discussion during the semester. Details for the weather discussions will be provided in class. Grades: The weighting of the components of your course grade is as follows: 35% homework and quizzes, 25% midterm exam, 30% final exam, 10% weather discussions. The final grade will be based on a standard grading scale à A: 93-100%, A-: 90-92%, B+: 87-89%, B: 83-86%, B-: 80-82%, etc. The instructor reserves the right to curve the grades to make this grading scale easier. Accommodations for students with disabilities: Penn State welcomes students with disabilities into the University's educational programs. Every Penn State campus has an office for students with disabilities. 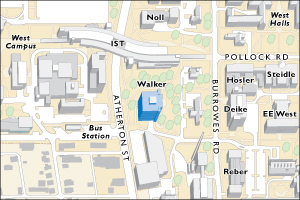 The Office for Disability Services (ODS) website provides contact information for every Penn State campus: (http://equity.psu.edu/student-disability-resources/disability-coordinator). For further information, please visit the Office for Disability Services website (http://equity.psu.edu/student-disability-resources). In order to receive consideration for reasonable accommodations, you must contact the appropriate disability services office at the campus where you are officially enrolled, participate in an intake interview, and provide documentation based on the documentation guidelines http://equity.psu.edu/student-disability-resources/applying-for-services). If the documentation supports your request for reasonable accommodations, your campus’s disability services office will provide you with an accommodation letter. Please share this letter with your instructors and discuss the accommodations with them as early in your courses as possible. You must follow this process for every semester that you request accommodations. Attendance: This course abides by the Penn State Attendance Policy E-11 and Conflict Exam Policy 44-35. Please also see Illness Verification Policy and Religious Observance Policy. Students who miss class for legitimate reasons will be given a reasonable opportunity to make up missed work, including exams and quizzes. Students are not required to secure the signature of medical personnel in the case of illness or injury and should use their best judgment on whether they are well enough to attend class or not; the University Health Center will not provide medical verification for minor illnesses or injuries. Other legitimate reasons for missing class include religious observance, military service, family emergencies, regularly scheduled university-approved curricular or extracurricular activities, and post-graduate, career-related interviews when there is no opportunity for students to re-schedule these opportunities (such as employment and graduate school final interviews). Students who encounter serious family, health, or personal situations that result in extended absences should contact the Office of the Assistant Vice President for Student Affairs (AVPSA) and Student and Family Services for help: http://studentaffairs.psu.edu/studentcare. Whenever possible, students participating in University-approved activities should submit to the instructor a Class Absence Form available from the Registrar's Office: (http://www.registrar.psu.edu/student_forms) at least one week prior to the activity. Cancellations and delays: Campus emergencies, including weather delays, are announced on Penn State News and communicated to cell phones, email, the Penn State Facebook page, and Twitter via PSUAlert (Sign up at: https://psualert.psu.edu/psualert/). Course Copyright: All course materials students receive or to which students have online access are protected by copyright laws. Students may use course materials and make copies for their own use as needed, but unauthorized distribution and/or uploading of materials without the instructor’s express permission is strictly prohibited. University Policy AD 40, the University Policy Recording of Classroom Activities and Note Taking Services addresses this issue. Students who engage in the unauthorized distribution of copyrighted materials may be held in violation of the University’s Code of Conduct, and/or liable under Federal and State laws. For example, uploading completed homework or other assignments to any study website constitutes a violation of this policy. Course website: The instructor will use Canvas to communicate with the class electronically. Canvas will also be used to post assignments, handouts, and visuals that are shown in class. Disclaimer statement: Please note that the specifics of this Course Syllabus can be changed at any time, and you will be responsible for abiding by any such changes. Changes will be posted to the course discussion forum.